The Compromise of 1850 set Texas's boundaries at their present form. 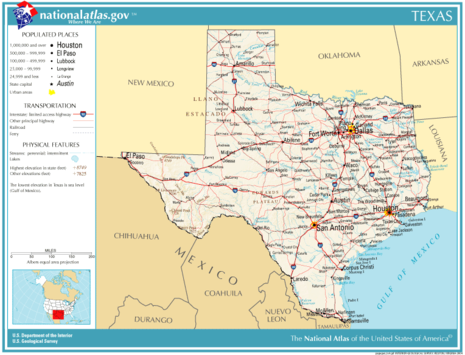 Texas ceded land which later became half of present day New Mexico, a third of Colorado, and small portions of Kansas, Oklahoma, and Wyoming to the federal government, in return for the assumption of $10 million of the old republic's debt. Post-war Texas grew rapidly as migrants poured into the cotton lands of the state. COMPROMISE OF 1850. 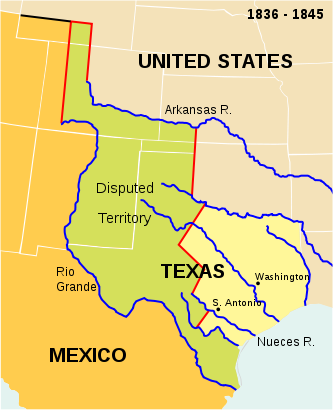 The results of the Mexican Warqv (1846-48) brought Texas into serious conflict with the national government over the state's claim to a large portion of New Mexico. The claim was based on efforts by the Republic of Texas,qv beginning in 1836, to expand far beyond the traditional boundaries of Spanish and Mexican Texas to encompass all of the land extending the entire length of the Rio Grande. Efforts to occupy the New Mexican portion of this territory during the years of the republic came to naught (see TEXAN SANTA FE EXPEDITION).